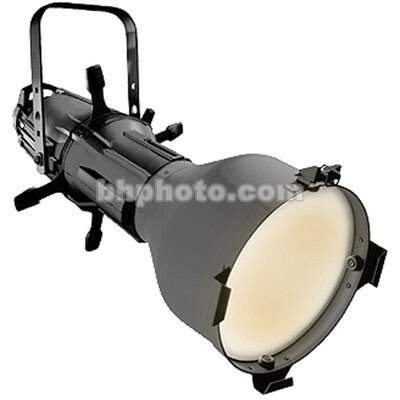 The Source Four 750 Watt Edison Plug Black 5° Ellipsoidal Spotlight combines the energy-saving power of the patented HPL lamp, with a dichroic reflector and optical-quality lenses. Source Four technology provides a clean white beam for unequaled imaging, crisp pattern projection, and a bright, even field. The optional EDLT lens tube option for 19, 26, 36 and 50° field angle models makes the Source 4 even better for ultra-crisp, high-contrast gobo projections. Rated for 375, 575 or 750 watts, the Source Four is perfect for punching through saturated colors and providing the longest throws. When fitted with a 750 watt HPL bulb (available separately), this fixture will provide a beam of 124 footcandles 12.6 ft (3.8 m) in diameter, from a distance of 105 ft (30.3 m). It will throw 50 footcandles 19.8 ft (6 m) in diameter, from a distance of 165 ft (50 m). This model includes a 3 prong Edison Power Plug. For this fixture with a Stage Pin plug, order #7060A1005B. For this fixture with a 3-prong Edison plug, order #7060A1005A. For this fixture with a NEMA Twist-Lock plug, order #7060A1005C. For this fixture with a Pigtail connector, order #7060A1005. Box Dimensions (LxWxH) 41.5 x 15.5 x 15.5"